Maguire Residence will provide affordable permanent supportive housing to people dealing with homelessness and addiction in Philadelphia's Kensington.neighborhood. Fourteen Wawa locations in Philadelphia are now accepting donations from customers to support a homeless shelter for those struggling with addiction in Kensington. Teaming up with Project HOME, Wawa is accepting donations in $1, $3 or $5 increments to fund the Maguire Residence, one of three new facilities the non-profit is opening to combat the neighborhood's drug epidemic. 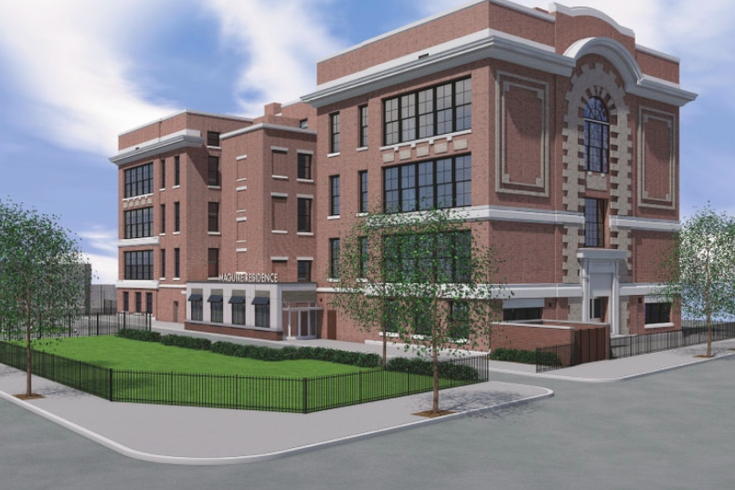 Funds raised during the campaign with Wawa will support ongoing recovery services at the 42-unit building, a former elementary school located blocks away from McPherson Square Park. The residence will provide affordable permanent supportive housing options for people who have experienced homelessness and are committed to recovery, Project HOME explains at a website for the Kensington initiative. Residents will have access to on-site employment services and paid apprenticeships focused on skill development and coaching. As part of the campaign, The Wawa Foundation has pledged to match the first $25,000 donated by Wawa customers. “The entire Wawa family is so inspired by the powerful work Project HOME does in our home town, and we’re committed to doing our part to provide long-term solutions to one of the greatest issues facing our city and our nation,” said Dave Simonetti, senior director of store operations for Wawa. “We’re proud to help support Project HOME and its Maguire Residence through Wawa and The Wawa Foundation by connecting our generous and committed customers to its critical mission and by matching funds raised."